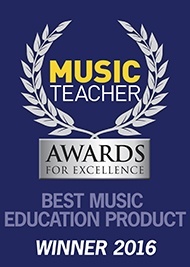 We were delighted to hear that pBuzz has been shortlisted as a finalist for the Best Music Education Product category in the 2017 Music Teacher Awards for Excellence, or the ‘Oscars of the Music Education World’, which celebrate excellence in music education. We launched pBuzz in June 2016 and in the few short months since, it has already been recognised as an outstanding education resource, winning Gold in the 2016 Primary Teacher Awards that commend excellence in product design, development and suitability for the early years and pre-school sectors. This year saw a record number of nominations and the winners of the 11 categories will be announced on 9th February 2017 at Sheraton Grand London Park Lane Hotel in Mayfair, alongside the winner of the Lifetime Achievement Award and Music Teacher Magazine Editor’s Award. The awards will be presented by a Classic FM host. Our pTrumpet won the same category in last year’s Music Teacher Awards, so we have our fingers crossed for a repeat performance!